Here is a screen shot of how the Tweet box appear on my Previous Post. How to add the Tweet Box on a Blogger Blog? 1. 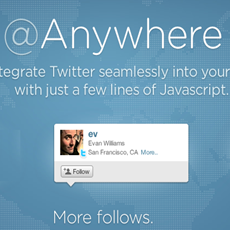 Go to the @AnyWhere Developers Page and create an Application there with your blog details. Coll one buddy. Really useful one. Can you please do a "how-to-add-facebook-comment-box-on-blogger-blogs" tutorial? can you add it to the main page on blogger not just below posts? Thanks, I translated my blog and I hope and others. I do not understand something else,but now is good. thanks for a nice article ! I have used the same on my blog and worked best for me !!! another awesome information. I'm looking for this for a long time. I'll include this on my site. not work on mozilla ? why ? really mind blowing one. .... and sure we are expecting for your next article, with URL shortening also ../. good one. visit this website to check the script in action at www.weblinksnetwork.com submit your website and boost your pagerank and traffic for free. can the defaultContent work on classic template? I tried and follow your instruction and it won't appear please help to review my creative and reply me your recommend. i couldnt find this code! i copied it in the search box on Chrome. help please. Cool widget. I like it, thank you. Thank you for the directions. I will give it a try. One question. How do you get it to appear only on certain Blogger posts? Like as a giveaway entry? I have a question. Do you know how to add the Tweet Box to specific posts on Blogger? For example, I would like to use it so people can easily tweet as a giveaway entry, with set words in it and a set height/width. Thank you very kindly! @TJ - the code in this post uses some conditional b:if statement to show the tweetbox on post pages only. You can modify this b:if statement to show it on a particular post page only. Nice Post, I followed both of your (Add Facebook Share and Add Tweeter count) But i have a little problem, that both are attached with each other... Is there any way to create space b/w them? Is there any way of changing the colour of the "Share the Love' bit? As it appears very dark on my site. I'm having a bit of trouble with this. I got the first piece of code in fine but can't locate the second part [point 5] is it up near the 'head' or further down? Which heading does it come under?